The Stuffed Brown Turkey 9 Inch Plush Animal by Fiesta makes for the perfect plush companion. Whether at home or on the go this brown turkey stuffed animal sees to it you’ll never have to go alone. Measuring at a convenient 9 inches, this plush brown turkey is big enough to wrap in a hug, but small enough to fit into a backpack or a carry-on bag. With quality construction and excellent coloring, this brown turkey stuffed animal offers cute and cuddly fun for years to come. 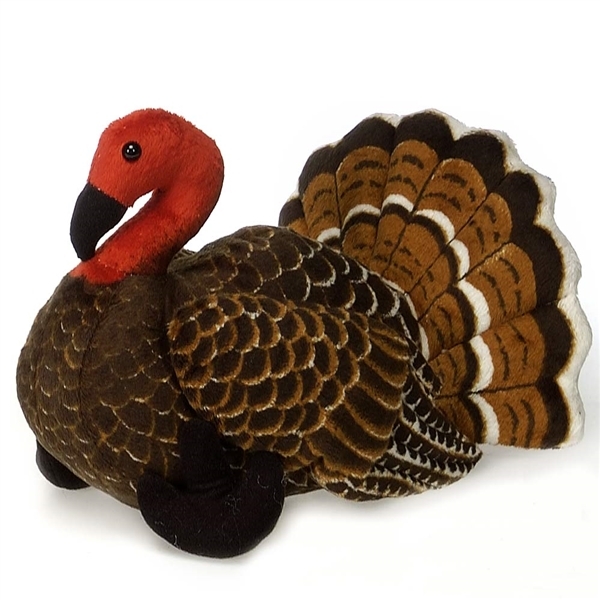 Make moments and memories to last a lifetime with your very own stuffed brown turkey. Because of its size and affordable price, a brown turkey stuffed animal works perfectly as a party favor. Whether you need just one or an entire flock of brown turkeys, you need look no further than the Stuffed Brown Turkey 9 Inch Plush Animal by Fiesta. For over 40 years, Fiesta Toy has been one of the world leaders and innovators in stuffed animals and plush toys. Their wide assortment of traditional and unique stuffed animals inspires creativity and imaginative play. Fantastic products like this stuffed brown turkey allow children to share in the magic of the animal kingdom and learn more about the fascinating creatures that inhabit and share our planet. The Stuffed Brown Turkey 9 Inch Plush Animal by Fiesta is made with all new, child safe materials and meets or exceeds all U.S. safety standards. Recommended for ages three and up, we suggest surface washing for this brown turkey stuffed animal.